At a carnival, young Josh Baskin (Tom Hanks) wishes he was big – only to awake the next morning and discover he is! With the help of his friend Billy, Josh lands a job at a toy company but the more he experiences being an adult, the more Josh longs for the simple joys of childhood. Download Big in Digital HD from the iTunes store. Big images are © 20th Century Fox. All Rights Reserved. It's a truism that kids can't wait to grow up, while adults, especially those of a certain age, wouldn't mind shaving a few years off of their adulthood to return to a more youthful time. That latter formulation is almost always tempered with statements like "if I knew then what I know now," a summation of one of the salient problems this kind of wishful thinking entails. Kids have a rosy eyed view of what being an adult is like—after all, adults get to do whatever they want (as if), are in charge of their lives (as if), and don't have a worry in the world (you know the drill). Adults on the other hand look back nostalgically on their childhoods as a time when most if not all of their day to day needs were taken care of by adults, and when the worst thing they had to deal with was an impending math test or feeding the dog. Neither of these points of view is completely accurate, of course, for each and every age we pass through has its own pleasures and tribulations. Depending on our mood, we're apt to focus on one category more than the other, and it's only the wisest among us who can really see the "big" picture (sorry), taking in the pageant of what life has to offer us in all its positives and negatives. But it seems to be an almost genetic proclivity of humans to wish for something they can't have, and that is perhaps part of the underlying allure of Big, a film which eschewed the common "trading bodies" syndrome that in other films (like Freaky Friday) had allowed a youngster to experience the "joys" of adulthood, and instead simply had a young boy named Josh make a wish to be big—a wish that improbably comes true. Josh Baskin (David Moscow) is a sweet pre-teen attending a carnival who is devastated when he finds out he's not quite tall enough to get on a ride (mostly cause he wanted to impress his crush). Disappointed, he begins tooling around the carnival and comes across a mysterious looking robotic fortune telling machine called Zoltar Speaks. Josh deposits his coin and….nothing happens. Upset, Josh gives the machine a good whack and suddenly Zoltar springs to animatronic life, eyes aglow and creaky machine joints moving in a kind of spooky manner. Finally, the machine dispenses a card informing Josh that his wish has been granted. Yeah, right. Big was co-written by Steven Spielberg's sister Annie, and it has that typically Spielbergian emphasis on the innocent days of childhood. But the film has a rather unexpectedly bittersweet subtext for a couple of reasons. Though it's not overly emphasized, there's the waking nightmare that Josh's parents experience when their little boy disappears. But perhaps just as emotionally meaningful is Josh's child eyed view of the world seen through grown up eyes. Though he charms his boss (Robert Loggia) and almost falls in love with a comely coworker (Elizabeth Perkins), he's also often confused and actually downright frightened. Tom Hanks brings this all to life in an amazingly well constructed manner, whether he's skipping through a basketball court or fumbling toward his first kiss. Big is notable for how it artfully combines wistful nostalgia, sweetness and more than a hint of melancholy. This often plays like the flip side of "going back to do it all over again". Instead of that formulation, Josh is thrust into his future life without being emotionally equipped to handle it. Even when he's engaging in things like that famous set piece atop the "piano mat" in F.A.O. Schwartz, there's the barest hint of worry and sadness behind Josh's hopeful eyes. He's seeing the adult world, but his mind's eye is still resolutely focused on what it's like to be a kid. Big is presented on Blu-ray courtesy of 20th Century Fox Home Entertainment with an AVC encoded 1080p transfer in 1.85:1. The nicely saturated color, and very fine detail in items like Zoltar's mottled face or the weave of the cardigans Josh wears are all expressed well on this transfer. The only other I could point out is that this has a rather soft overall ambience which some may attribute to a lackluster transfer when in fact it's an accurate representation of the original cinematography by future director Barry Sonnenfeld. Big features a lossless DTS-HD Master Audio 5.1 track that is really rather surprisingly immersive for a comedy of this type. Right off the bat, the carnival sequence sets the aural scene, with a nicely rendered accounting of noisy crowd sounds whisking through the side and rear channels. A number of later moments, including Josh's iconic musical moment at F.A.O. Schwarz, also capture a nice sense of space and ambient environmental effects. The film's dialogue is never less than clear, and Howard Shore's appealing score also sounds great in this lossless format. Theatrical Version and Extended Cut of the film. "Big" Beginnings features writers Annie Spielberg and Gary Ross discussing their work. Chemistry of a Classic concentrates on the casting. The Work of Play looks at the toys in the film. Hollywood Backstory: Big is an interesting episode detailing the film's genesis and shoot. TV Spot - "Adult Review"
For the record, there's also a Bonus DVD containing the Theatrical Cut. 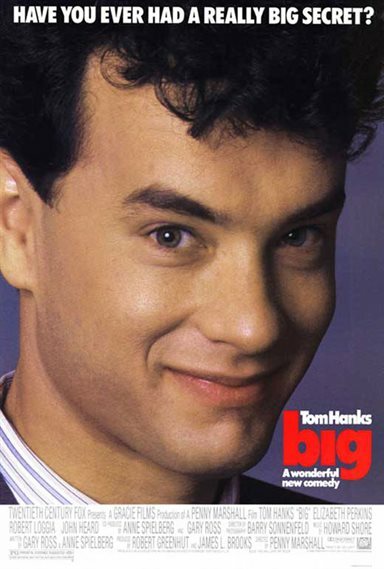 Big is a beautifully wrought film, one with unobtrusive direction from Penny Marshall, and a nicely written screenplay Annie Spielberg and Gary Ross. But it's the performance of Tom Hanks that carries this film and elevates it into the completely memorable experience it is. Very funny at times, but also surprisingly touching and even just a little bit sad now and again, Big may have you reassessing where you are in your life's arc, hopefully helping you to realize it's best to be thankful of your current "location", no matter where that is. The original Blu-ray release seems to be out of print now at Amazon, and while there's nothing much new here other than packaging and some minimal swag, the price is right, so for those of you who didn't get this the first time round, stop wishing for it: it's here.